As a Jamaican and city boy Kingston has a special place in my heart… but so does Tokyo. A year ago I would not even be in a position to compare Kingston with Tokyo but fortunately I can now (somewhat) and can even relate to a super awesome article shared with my by a Twitter follower written by CNNGo entitled “50 reasons Tokyo is the world’s greatest city“. I thought I share 6 entries from the list that resonated with my geeky and Japan-loving heart during my short experience being in Tokyo last year. I also made my own list of 10 things I miss about Japan that should be interesting, nostalgic or maybe even inspiring to many. If you have been to Tokyo or want to comment on something from the list feel free to share a comment below. With 13 subway lines and more than 100 surface routes run by Japan Railways and other private companies, Tokyo’s railway system seems like it was designed to win world records. It’s rare to find a location in the metropolitan area that canâ€™t be reached with a train ride and a short walk. Now, if only the government could devise a way to keep middle-aged salarymen from groping women onboard. The scramble street crossing outside of Shibuya Station is easily the world’s busiest, with a thousand people running into the middle of the street, weaving together in a huge organic mass. The scramble perfectly summarizes the essence of Tokyo’s true tourist landmarks: not old buildings, but lots and lots people coming together in celebration of culture. The Japanese have taken their love of the latest electronic gadgets and modern appliances to a new level with Yodobashi Akiba, the largest electronics store in a section of Tokyo known for being the center of gadget, video game, and anime culture in the city. Going into any electronics store in Akihabara is like stepping into a wonderland of flashing lights and monstrous screens, but Yodobashi ups the ante by offering six massive floors of televisions, stereos, appliances and game consoles, with three more floors dedicated to restaurants, juice bars, bookstores and music shops. At a manga-kissa, or “comics cafÃ©,” a few hundred yen per hour nets you a tiny booth with a reclining chair, Internet-enabled PC, an endless supply of all-you-can-read comic books, and bottomless soft drink refills. Ostensibly created for manga freaks, these miniscule rent-a-chairs are fast becoming popular for another reason: they offer young couples and salarymen alike a super-cheap place to kill time and catch some Zs. The extensive Manboo! franchise (despite a name and logo that border on copyright infringement) is the most recognizable manga-kissa, and its flagship storefront in Kabuki-cho is perfect for hostess-club Lotharios who’ve missed the last train home. Sure, at some stores around the world, the staff are experts in their field, hoping to wait on your every wish and command. Japanese department stores such as Mitsukoshi and Isetan have that, of course, but they add in a few other perks: an army of uniformed women running automated elevators, and bowing greeters at the door. The time-consuming, multi-stage gift wrapping is also unparalleled, perhaps justifying the premium prices. Talk about hiding in plain sight. When Tokyo’s Bureau of Waterworks decided to paint its official PR mascot character “Mr. Earth” atop the roof of their Shibaura facility, they didn’t mess around. Although you can’t see it from street level, it’s actually visible from several kilometers above the Earth’s surface. Be sure to read the full article on CNNGo. Tokyo is an amazing city and an adrenalin rush! There are some many cool reasons that make it one of the world’s best cities. Tokyo is unique in the world – not because it’s the busiest, or the biggest, or even the most technologically advanced. It’s unique because it (in so many ways) was the first of the real megapolis cities. Whilst Japan is not quite a melting pot (in terms of racial homogeneity), it is a melting pot in terms of all things Japanese, being an amalgam of so many bits of Japan, it’s people, geography, history, fashion and culture. 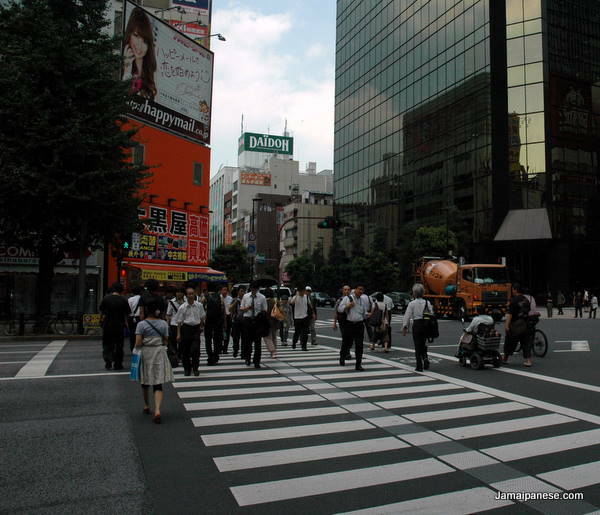 Having said that… whilst Tokyo is unique, and has a special place in history (and my heart), it’s also caught somewhat in a time-loop of it’s own success. The challenge it faces is how to truly remain on the edge of everything when the rest of the world is starting to increasingly over-take it. This is something the Japanese have themselves not recognized, or have denied as being some strange anomaly. Though history has a way of repeating itself. Still – even if Tokyo doesn’t change a jot, it will remain one of the most amazing cities in the world, and loved by many.